"No tablet besides the iPad is selling in volume at the moment. The Galaxy Tablet, Samsung's big hope, sold about 250,000 units in the high selling fourth quarter even though stores had around 2,000,000 to sell. Motorola's Xoom supposedly shipped in similar numbers and since it has launched sold around 100,000. This is against 300,000 for the iPad 1 over its launch weekend and most estimates have the iPad 2 at around twice that during it's launch weekend and Apple appears to be selling every one of those they can build." It seems that everyone has become an expert on mobile device market share. Here's a story from a somewhat well-known analyst opining that, while devices are available, and have been shipped to retailers, only a fraction of them are selling. Gosh, why could this be? Maybe because the economy is still struggling, and that consumers are finding it hard to plunk down their hard-earned money on relatively unknown devices? iPad 2 devices are selling, maybe in part because they're known to the consumer, and are a 'safe' purchase. Look at the UI of an iPad vs. the UI of the Xoom. 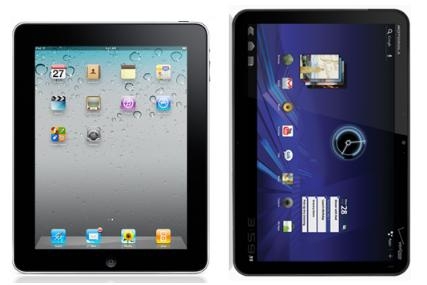 The iPad whispers "friendly and uncomplicated," while the Xoom screams "techie and Android." Standing at a Best Buy several days ago, the iPad 2s were being swarmed by potential buyers, while the Android area had a teenager playing and game on a Xoom, and me. Several Galaxy Tabs were there, but drew no interest. Admittedly non-scientific, but observation can be a powerful tool. What does Motorola need to do to get potential buyers interested in the Xoom? Technology comparisons just aren't working. Ideas?